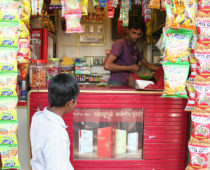 Tobacco companies aggressively block, weaken, and undermine policies designed to protect public health and reduce tobacco use, and at times they may work outside of India’s laws. #PhilipMorrisInternational is being accused of illegal tobacco advertising in India. I support an immediate government investigation into these allegations! In India, Philip Morris International allegedly promoted Marlboro cigarettes by advertising them at tobacco shops and distributing free cigarette samples. Reuters: "India's Delhi government tells Philip Morris to remove all ads"